The solar powered intelligent street light is 4000 lumens. The light has a size of 96 cm x 30 cm x 9 cm, and is constructed of aluminum alloy and tempered glass. 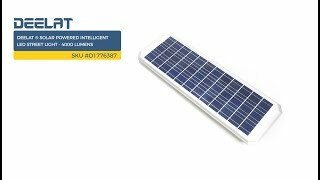 The solar powered intelligent LED street light has solar panels on the top of the unit to absorb energy during the day and release it at night through LEDs. It uses an intelligent system to reduce the lumens during winter months and dark periods so that the light can be active during a longer period throughout the night. The light has a charging time of 10 hours by bright sunlight and is equipped with a motion sensor. The solar powered intelligent street light can be used in gardens or courtyards as well as for extra lighting in parking lots. It also serves to brighten pathways in parks or on campuses. *Pole not included.